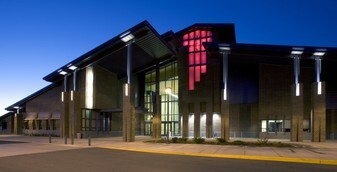 EHS- current building, completed January, 2005. This building is constructed on the old baseball fields and faces south toward Capitol Avenue. There is no parking on 3rd street. With the new building, all doors are locked and you can only enter the building from the front doors off Capitol. All students, teachers and visitors park in the south and east parking lots. Due to student request, there are 60 parking spots closest to the school marked for seniors only- that would be EHS seniors, not senior citizens! 'World, Past and Present' is now called 'World Affairs' but is still the senior history that must be passed to graduate. It is taught by just one teacher, not tag teamed like we had with Mr. Vancil and Mr. Leavitt. EHS and Morgan Middle School both have full time police officers on campus every day. They help with security, discipline, and any other tasks the administration needs. There are video surveillance cameras everywhere, with a lnk to a very large screen in the main office that rotates views from each camera. Eyes are everywhere! Remember the driving range east of the school, where you practiced driving during your semester of Driver's Ed? It's now a parking lot for the newest elementary school, Valley View. Driver's Ed is no longer offered as a school class- kids must sign up for a private class in Ellensburg or Yakima. EHS continues to offer curriculum similar to what we had, but 6 Advanced Placement classes have been added: AP Biology, AP Calculus, AP Junior English, AP Senior English, AP US History (juniors) and AP Government (seniors). These classes have a national curriculum, are college prep classes and can be tested at the end of the year with a national test. If the kids do well enough on the test, they can get college credits waived. The new shop areas are incredible, with the addition of a state of the art car painting chamber! EHS recently received a PEP grant, bringing incredible funds into our district for Physical Education. The Ellensburg School District PE teachers have become speakers on the national level to share ideas with other districts. Brian Hagbo, EHS PE teacher, was recently chosen as the Washington State Physical Education Teacher of the Year. Link Crew has been added to EHS, bringing select upper classmen together to provide support and orientation for new freshmen. Every incoming frosh is paired with a Link Crew leader. Stuffing freshman in lockers is no longer the way to greet them to high school. The senior wing is still intact, and connected to the new building. However, it's now called 'Wing 10". The general look of the building is the same. Senior skip day has been replaced by a school funded, all senior trip to Seattle for the day. This happens a week or so before graduation, and if you're passing all your classes and not in trouble with the school, you can go. Lockers are located in the new school, and are assigned alphabetically, all 4 grades. So freshman through seniors are all mixed together. The old lockers in the senior wing are not used. There is no DECA/VICA any longer- they have been replaced by FBLA (Future Business Leaders of America). EHS has a very strong FBLA chapter and the kids compete all the way to the national level. And no, there are no candy sales at the end of the hallway at break! There is now a school store, open at lunch time to sell clothing, some food items and EHS items. The weight room is one of the nicest in the state, and there is still a dedicated wrestling workout room. The gym complexes are amazing, and there are 4 locker rooms- varsity locker rooms upstairs and class locker rooms downstairs. There is still formal tolo in November, grub tolo in early spring but a combined Junior/Senior Prom in May. The kids seem to enjoy the tradition that only junior and senior boys can bring dates to Prom. The senior party continues to live on, with parents going crazy with decorations and fun activites. However, there is no longer a hay ride in the early morning- too many complaints from residents along the way with hay in their mailboxes and destruction to their property. The senior party now ends around 4 a.m. and the kids head home (or on to their next scheduled activity......). Parents can now check their kids' grades every day online. The new grading system allows all tests, assignments and projects to be updated and viewed by parents on a regular basis. So, there are no surprises when grades come home! 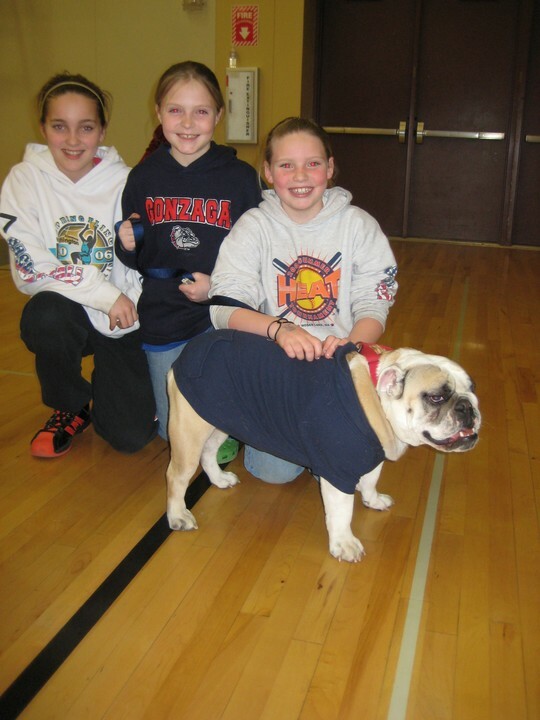 This year, there has been a live, breathing bulldog at all home basketball games! This photo was taken on 2/26/09 at a district girl's basketball game. These elementary girls help with the varsity girl's team. Open Campus! Going out to lunch is still a highlight for all kids who can drive. The Morgan Middle School building- same wall colors, same penitentiary look. There is a new wing (beyond the 8th grade wing) that was built in the mid-90's with new science labs and new home ec facilities. The gyms and auditorium look exactly the same. The school district has presented bonds to the community two different times to re-build Morgan, but they have both been voted down. The EHS football field and track look very much the same, with a newer concession stand in the northeast corner of the track area. Our band and choir programs continue to be some of the best in the state. Athletically, we do really well at the 2A level and routinely send kids to state in many different sports. EHS continues to produce award winning publications. You can find the current Alutant as a link on the EHS website (see the link above), and the yearbook continues to be outstanding. The FFA program is going strong and continues to attract large numbers of kids. They have great success at our Kittitas County Fair, with competitions in the region and also at the national level. EHS continues to produce strong High School Rodeo participants, and many have gone on to participate in college rodeo in the last few years. The senior prank continues. Two years ago everyone arrived to school and there were about 100 tires stacked in front of the school entrance. The early morning PE classes got their workout by moving them so the entrance was clear. The school busted the seniors responsible and sentenced them to community service with the tire company (for stealing the tires), and threatened to call the police and have them arrested for theft. When the senior boys showed up to do their community service for the tire company, it was all a big joke. The school administration had pranked the kids back.